Christmas is on its way. It's time to get moving! But I don't mean with your Christmas shopping, cards or holiday parties. Put all of that aside for an hour and jog on over to L'île aux Cygnes because the City of Paris has recently installed a free outdoor fitness center on the tip of the narrow tree-lined island. Complete with small climbing walls, ladders, suspension bikes and different machines to work your muscles, you can contemplate the Eiffel Tower and the boats on the Seine as you work off all the foie gras and champagne. 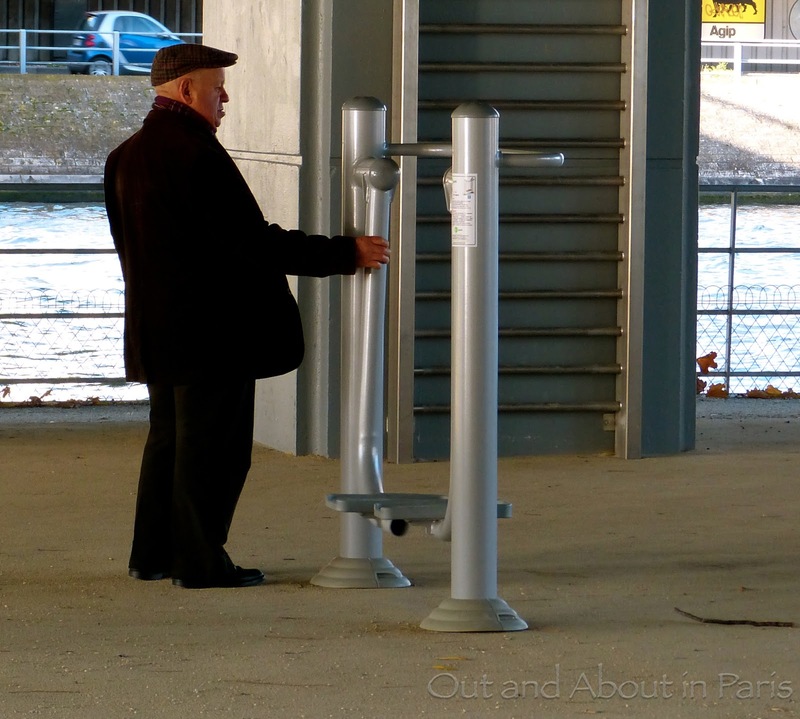 Best of all, you can exercise whenever it suits your busy holiday schedule because the entire area is lit at night and protected from the rain by Pont de Grenelle. To avoid injury, be sure to read the instructions panels on each machine. Located in the 15th and 16th arrondissements, visitors most frequently associate L'île aux Cygnes (Isle of the Swans) with the Statue of Liberty. Standing at the very tip of the island, she gazes westward towards her famous sibling in New York City and bears a tablet with the inscription IV Juillet 1776 = XIV Juillet 1789, in honor of the American Independence Day and Bastille Day, respectively. If you need a little reward after your workout, I highly recommend the apple pies at the nearby Poilâne Bakery at 49 Boulevard de Grenelle. Fresh air, beautiful view - exercising can't get much better than this! A Parisian studying (rather skeptically?) one of the exercise machines. The exercise machines also make handy seats to rest and drink some juice. Wow! I've never seen it there before (I lived in the 15e arrondissement for 2 years, right next to Bir Hakeim). What a great idea from the City of Paris. Depending on how long it has been since you've been back to the 15th, it's not surprising that you didn't see the fitness center when you lived there because it was only completed at the end of October 2012. Isn't it amazing how Paris seems to stay the same yet change at the same time? It's one of the things that I like most about the city. Great idea, and it must cost only a little bit of money for something that could potentially have a big public health benefit. Not sure I would be brave enough to work out at night under a bridge in a park though, even if it is lit up! I probably wouldn't exercise on my own at night but I didn't feel worried when Stephane and I went there on Saturday night. The island gets quite a few visitors to see the Statue of Liberty and to embark on dinner cruises so it's not eerily empty. But still, it always pays to be cautious! Ooh, I like the bikes! I do, too! I think, however, that the bikes are more for kids than adults because they're a bit low to the ground. There are swans in the Seine? Really? Why can't I remember ever seeing them? Come to think of it, Joseph, I should have used something else besides swans because I've only rarely seen them on the Seine. And when I have, it's close to the areas where the boots are moored and not near the "Isle of the Swans". I'll go back and edit that part. Thanks! Not to be a skeptic, but I am not confident that equipment is going to last long.... thinking I'll have to head on over tomorrow before its vandalised! I hope it's not vandalized! That would be a real shame. How cool, we have these in several parks here in Miami; so far they're very well kept and in good condition. Ha! I had to laugh when I read your comment because I recently had lunch with an American expat friend from Miami who was talking about the dreaded cold of winter! I also wanted to say "thanks" for letting me know that they have similar exercise equipment in FL because I thought it might be originally a French idea, like the velibs. There are quite a few of these outside fitness areas scattered through Melbourne...and they survive very well. I too like the bikes! And here I thought that the French were on to something new! It's good to know that there are fitness areas like this one in Melbourne. In Switzerland, they have Vita Parcours, or fitness trails, but it's more stationary wooden structures than exercise machines. That's a nice idea. As with the pianos you had up there in Paris in June, I'm quite surprised and gladdened that theft and vandalism aren't problems. Let's hope that theft and vandalism aren't an issue. I really like that the City of Paris used the space under a bridge to make an exercise area for its residents and visitors. Love the expression on the face of the guy in the third photo. He doesn't look inclined to use the equipment! His expression was priceless! When I saw him studying all the machines, I thought that I would love to hear what he tells his cronies at the cafe about the newfangled contraptions on L'île aux Cygnes.